India has slipped to eighth rank from the top spot in terms of business optimism, with 69 per cent of the corporates having a positive outlook on the economy and growth of operations in 2014, says a survey. India has ranked eighth in the list which was topped by United Arab Emirates and Philippines, where 90 per cent of businesses said they are optimistic about growth and the economy, followed by Peru at 84 per cent, according to Grant Thornton's International Business Report. 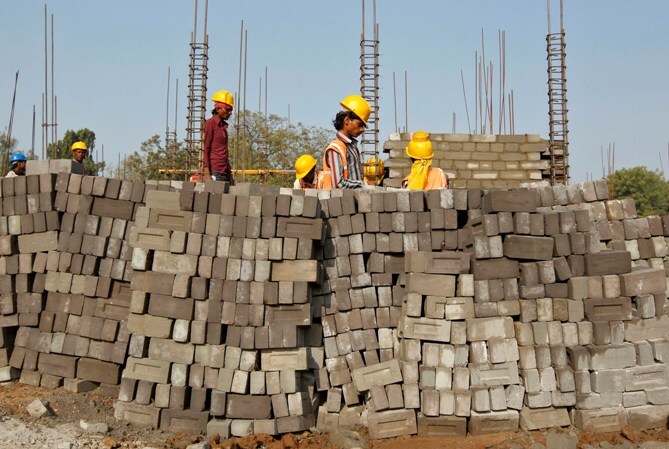 Image: Labourers work at the construction site of an educational institute in Gujarat. "India has slipped from topping the optimism charts in the IBR for five consecutive years to now falling to no 8 on the global tables," Grant Thornton India LLP National Managing Partner Vishesh Chandiok said. IBR is a survey of both listed and privately held businesses. The data was drawn from interviews with 3,500 senior executives across industry sectors and was conducted between November and December 2013. With strong sentiment for change in the recent state elections and decisive actions by the RBI/government in last few months, it's easy to see how medium to large businesses in India are more optimistic about the outlook for the economy in the coming months, Chandiok added. 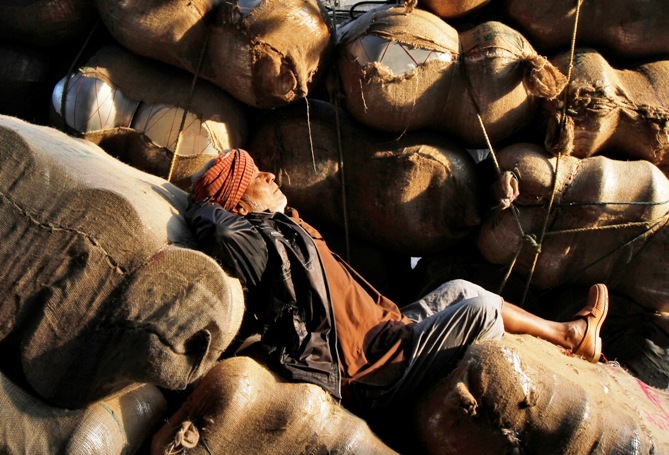 Image: A labourer sleeps on sacks filled with aluminium utensils loaded on a hand cart along a road at a wholesale market in Kolkata. "Whilst there is risk in expecting too much too soon from the current regime or any new regime, I certainly expect a dramatic turn in sentiment towards positivity from Q2 FY14-15," he said. Moreover, the appointment of Raghuram Rajan as the governor of Reserve Bank of India seems to have steadied the economy and provided the much-needed confidence to Indian businesses, the report said. According to the report, 90 per cent of Indian businesses believe their revenues would rise in 2014 while 76 per cent are most optimistic for increasing profitability this year. 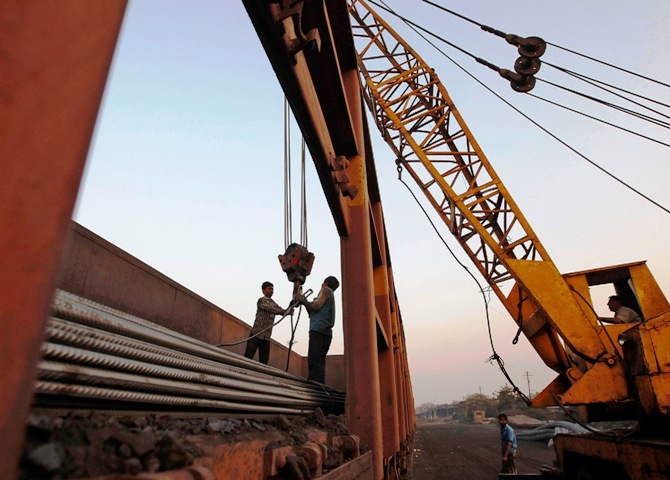 Image: Workers prepare to unload steel rods with a crane from a goods train at a railway yard in Ahmedabad. Around 35 per cent of businesses are also hoping to witness a jump in exports. Research and Development initiatives are also likely to get a boost this year with 46 per cent businesses betting big on R&D. About 65 per cent businesses foresee a rise in employment in 2014. "Despite optimism on several fronts, Indian businesses still feel the pinch with respect to low availability of finance," the report said, adding that 52 per cent of companies believe shortage of finance is likely to hurt their business and derail their growth plans in 2014. Other constraining factors include rising energy costs, regulations/red tape and lack of skilled workers. 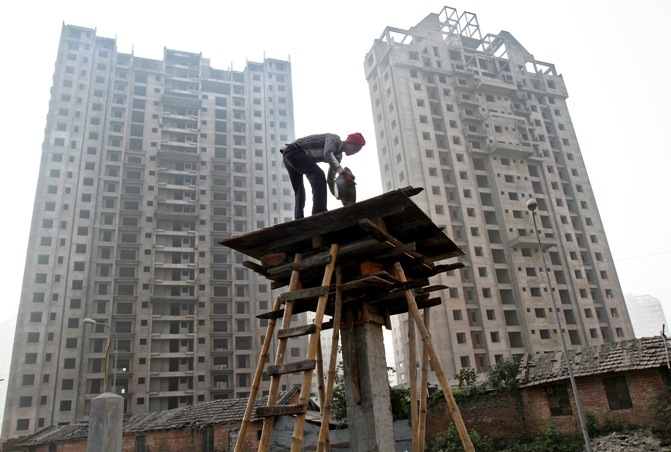 Image: A labourer works at the construction site of a residential complex in Kolkata.